Salomon Womens Snowboards - Gypsy 2018 - All-Mountain, Freestyle, Hybrid Camber. Salomon Gypsy Womens Snowboard 2018. 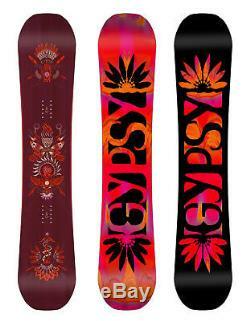 Migrating from parks to street just got easier with Desiree Melancons ride of choice, the Salomon Gypsy Snowboard. This is the big sister to the Oh Yeah and an amazing all mountain freestyle board for the ladies. Featuring a new Villain inspired shape with quadralizer sidecut, Slingshot Sidewalls for more control, maneuverability, and better flex in the park. The Gypsy uses Salomon's rock out camber profile which is a stable flat zone between your feet, camber under foot and reverse camber in the tip and tail. This gives a nice stable ride thanks to the flat section, plenty of pop and grip thanks to the camber and a catch free ride thanks to the reverse tip and tail. Want a freestyle edge you can take anywhere on the mountain? The Gypsy is the one for you. Sintered Base - Fast gliding base created by a hard surface and good wax retention. Medium Stone Finish - Makes the base quicker in all snow conditions, from cold morning corduroy to spring slush. BA MD - Medium density European-made fiberglass layers. True Twin - Freestyle specific shape. Freestyle Edge Bevel - This delivers the complete blend of edge hold and forgiveness on rails. Popster Booster - Added energy from under your feet radiating on the tip/tail maximizing pop. Aspen SLCT - Unparalleled core quality and lightness. Quadralizer sidecut - Equalizer and Quadralizer lines blended together for better edge control and precision. Rock Out Camber - Flat between your bindings for stability, Camber near the feet for response and a rocker on the tip/tail for press-ability. SLINGSHOT - Carbon inlays that help load and release energy. Medium Flex - Medium flex is adapted to riders that need to feel good on each type of terrain, for each type of practice. Order before 3pm for Same Day Dispatch. This product has no reviews yet, however see what our buyers say about our other products.. We therefore recommend you supply us with a deliver address where there will be someone in to sign for the goods and also a contact telephone number. If you need anything quickly or delivered somewhere not covered, please feel free to drop us a line. Where a genuine attempt or attempts have been made to deliver an item without success, the parcel can be re-delivered at your expense. We will always endeavor to ensure you receive the parcel as soon as possible. To guarantee that you receive your order in time, you should make sure that you. You can give us your work address or an alternative address, where you know someone can sign for the parcel if you won't be available at the billing address. Use the tracking / consignment number that we send to you after the order has been dispatched. No one was home to sign for the parcel or if the driver was unable to locate the address. You can then contact the courier to arrange for a redelivery or solve any issues in terms of your specific order. How to return a product. In all circumstances, you will be responsible for the item or items until they reach us. Please include the original invoice that was included with the product(s). If you do not have these details available then pass on as much information as possible on a covering letter. If you live in Exeter, or the South West of England please feel free to come and visit the warehouse to see/try our Snowboards, Snowboard Boots, Snowboard Bindings, Ski Snowboard Goggles, Ski Snowboard Gloves, Skate Shoes, Dakine luggage and backpacks, Sanuks or any of our other products. You may also be interested in.. The item "Salomon Womens Snowboards Gypsy 2018 All-Mountain, Freestyle, Hybrid Camber" is in sale since Monday, February 5, 2018. This item is in the category "Sporting Goods\Skiing & Snowboarding\Snowboarding\Snowboards".